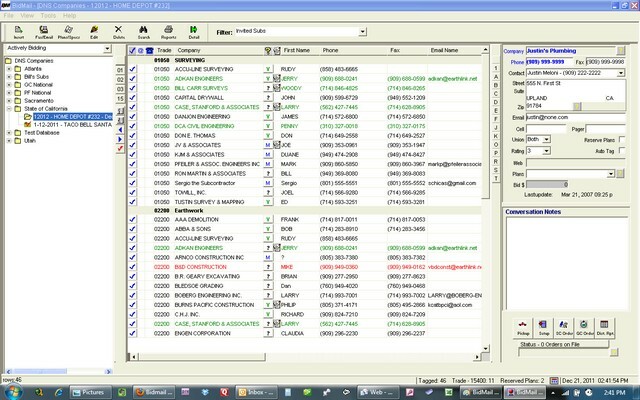 BidMail - Repro X-Press, Inc. : Repro X-Press, Inc.
BidMail is the most comprehensive, user intuitive bid management and document control system for contractors available. Designed by estimators for estimators, BidMail facilitates and coordinates essential communication with subcontractors during the bidding process, project management phase and close-out. BidMail allows the General Contractors to spend less time managing the documents and more time bidding and managing the work. BidMail is the standard for document management and distribution in the construction industry today, but your experience is only as good as the people behind the system. At Repro X-Press, we specialize in BidMail. Our people are trained and have worked with the developers of BidMail to provide our clients the best and most reliable service in the construction industry. The best thing about BidMail, is that it is FREE. Please contact our Account Executive for more information at service@reprox-press.com or call 866.364.8569. Need instructions on BidMail usage? Click here to view the BidMail User’s Manual. © 2019 Repro X-Press, Inc.